I don’t know about you, but in the Laroche household Christmas lasts all week long! Come take a journey with me! Saturday we took off to Rhode Island where we spent the weekend sipping yummy cocktails and opening prezzies with Kevin’s family. It started out with dinner and drinks – and hot tub fun – at my Father in Law’s house where we spent the night and enjoyed a yummy breakfast at the English Muffin – it’s a real place! We then ran off to Kevin’s Mom’s house for our annual Cookie Swap! We didn’t make cookies this year because it always ends up coming to work with me! We had delicious baked stuffed shrimpies for lunch and Kevin and I gave out gifts to everyone that was there. 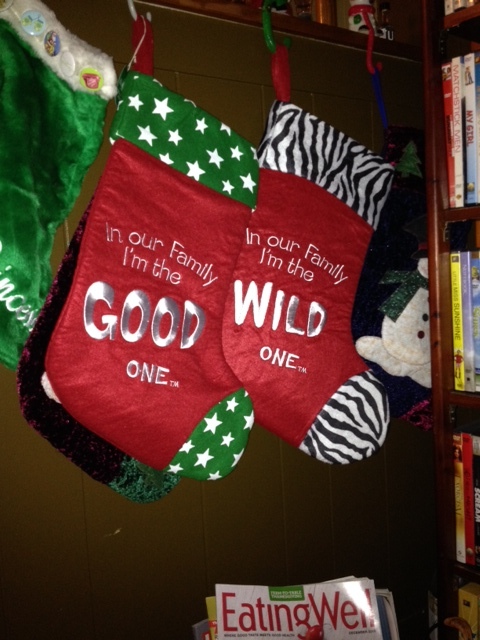 I found these ADORBS stockings after Christmas last year and I thought it would just be the most hysterical gift for his family – they are all unique in their own way! Aside from these, there was Normal, Wicked, Smart, etc. It was s super idea and they just loved them! We relaxed the rest of the day and I gobbled up as much dinner as possible since I had to fast starting at midnight for surgery Monday. Monday started out rough since I woke up at 8am starving and surgery wasn’t until 3:30pm! aye! Hit up the nursing home to surprise Kevin’s Grandfather who was SO beyond happy to see us, we were his Christmas present he said. It was such a treat to be able to see him! Our 45 minute trip to Boston turned into over 2 hours because of an accident! Got to my appointment on time – got cut open and jumped in the car back to CT! See my surgery update here. It has certainly been a long few days! 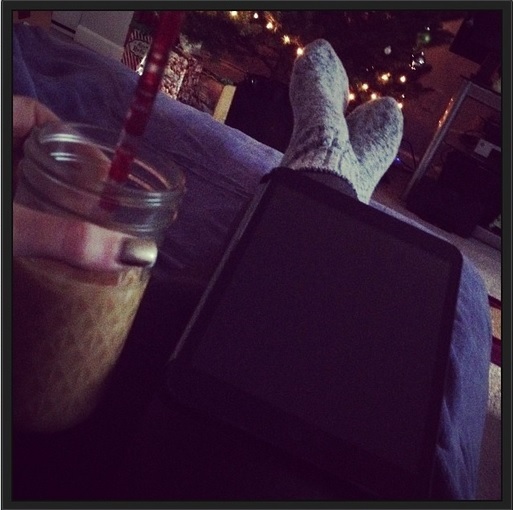 Christmas was nice and relaxing! 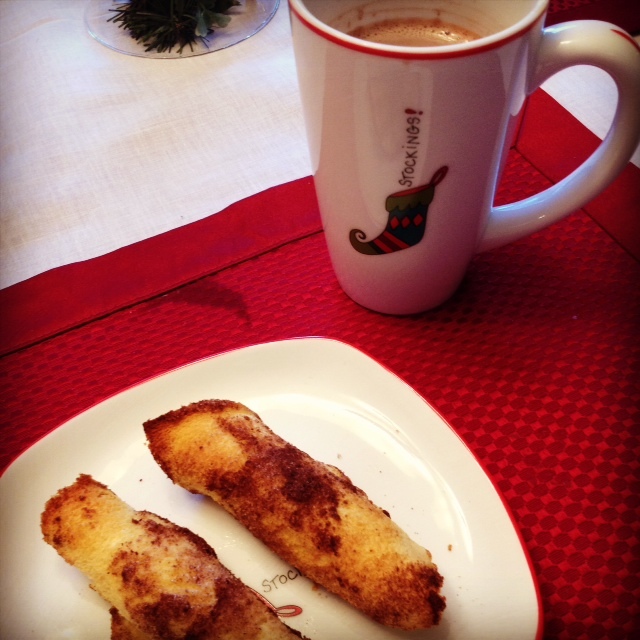 I woke up early and let Kevin sleep in while I made Cinnamon Rollups and Hot Chocolate with Baileys – YUM! 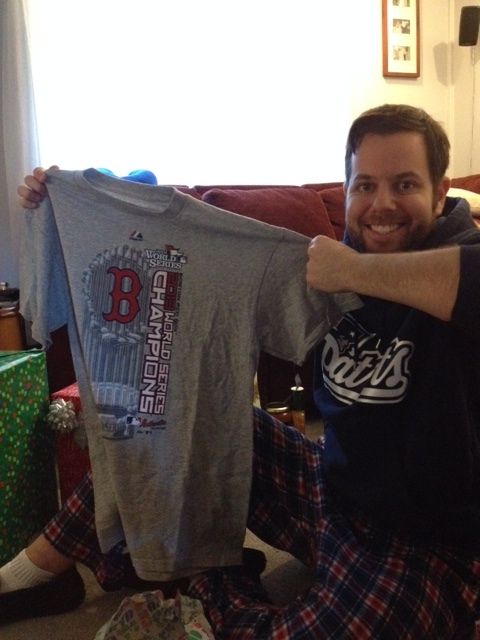 Meanwhile, Kevin enjoyed his Red Sox shirt along with his Vienna Beef goodies!! 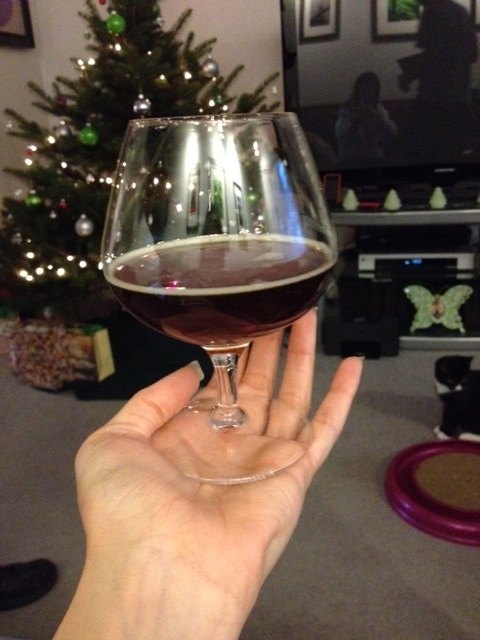 My brother rolled in around 3pm from Boston and we enjoyed Beernog – here’s the pic minus the ‘nog. It wasn’t great. Unfortunately, I had to work the day after Christmas but I got here bright and early at 6:45am so I could get out early and get ready for my parents to arrive!! 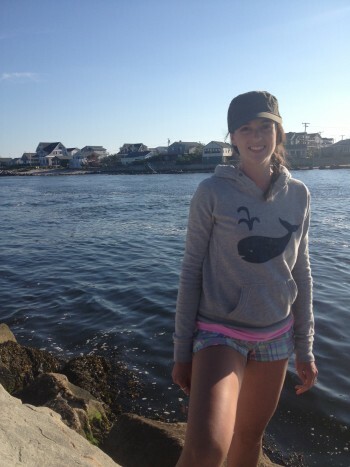 I’m so excited to spend the weekend with my family! I’m still waiting for one for gift to arrive for my brother!! I’m so mad about that. I hope it comes today. 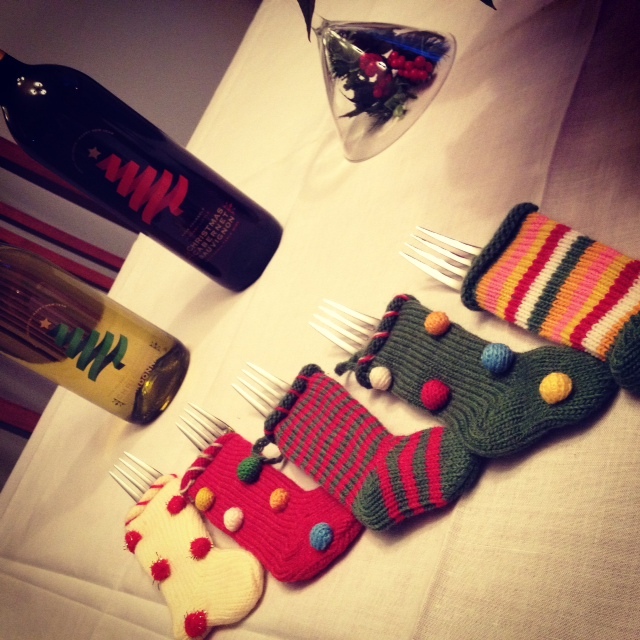 Here’s a sneak peak at my table with a few festive goodies!! Keep on being jolly! This entry was posted in Uncategorized on December 26, 2013 by Danielle Laroche. 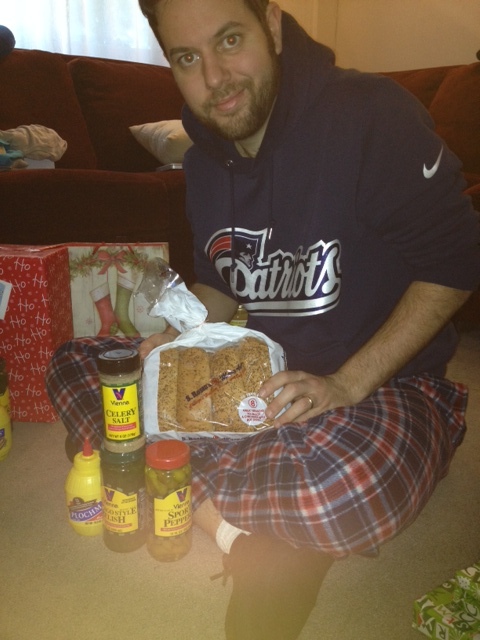 The Christmas Stockings for everyone was such a great idea. Many many years ago (in the 1970’s), Memere’ did the same thing for all of us. Everyone received a present that they all had to open at the same time. They were all Christmas Stockings with our names on them. I really liked your idea of “personality” stockings. Of course, I am the “Good One”!